Professor Roy Sidle’s research focuses on bio-geophysical aspects of sustainability, including natural hazards, catchment hydrology and management, and interactions between socioeconomic pressures and responses and ecosystem processes. Specifically, he has been working on issues of environmental effects of land cover change, erosion processes exacerbated by mountain road building and grazing, coastal and mountain hazards – both water and sediment-related, cumulative effects of land use on water supply and sediment, and fundamental research on water movement in mountain catchments. 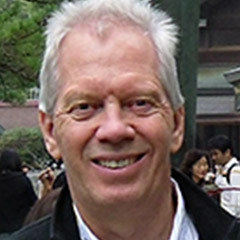 His research connections and collaborations with Japan, particularly at the Disaster Prevention Research Institute of Kyoto University and Tokyo University of Agriculture & Technology, as well as with INRA (France) and National University of Colombia – Medellin, KFUPM, and JICA have contributed to studies that will help to improve disaster preparedness and resilience as well as promote a better understanding of ecosystem processes that perpetuate these disasters. Professor Sidle’s research on catchment hydrology and management directly relates to this natural hazard agenda as it provides the geomorphic and hydrologic setting in which these hazards occur. As such, understanding the fundamental processes of water and sediment movement and storage in catchments is key to better estimating the extent of flood, cyclone, chronic erosion, and landslide disasters. These topics provide the geophysical foundation for comprehensive sustainability studies. Current research in Australia is supported by CSIRO (runoff and erosion in the Burdekin catchment) and SEQ Water (landslide studies). He has collaborated across a broad range of disciplines including socio-economists, engineers, aquatic biologists, environmental modellers, geotechnical experts, and agriculture and forestry specialists. His interests in sustainability issues in developing nations of Southeast and East Asia where rapid land use change and shifting demographics are occurring are of particular relevance to the University of the Sunshine Coast’s Sustainability Research Centre. R.C. Sidle, A.J. Pearce, and C.L. O’Loughlin. 1985. Hillslope Stability and Land Use. Am. Geophysical Union, Water Resources Monograph No. 11, Washington, D.C., 140 p.
R.C. Sidle and H. Ochiai. 2006. Landslides: Processes, Prediction, and Land Use. Am. Geophysical Union, Water Resources Monograph No. 18, Washington, D.C., 312 p.
R. Herrmann, R.C. Sidle, W. Back, and A.I. Johnson (editors). 1995. Water Resources and Environmental Hazards: Emphasis on Hydrologic and Cultural Insight in the Pacific Rim, Am. Water Resour. Assoc. Proc., AWRA, Herndon, Virginia, 496 p.
R.C. Sidle (editor). 2002. Environmental Change and Geomorphic Hazards in Forests, IUFRO Research Series, No. 9, CAB International Publishing, Oxen, UK, 241 p.
R.C. Sidle, M. Tani, Abdul Rahim N., and Tewodros Ayele T. (editors). 2004. Forests and Water in Warm, Humid Asia. Proceedings of a IUFRO Forest Hydrology Workshop, 10-12 July 2004, Kota Kinabalu, Malaysia, Disaster Prevention Research Institute, Uji, Japan, 274 p.
R.C. Sidle and G.V. Johnson. 1972. Evaluation of a turfgrass-soil system to utilize and purify municipal waste water. Hydrology and Water Resources in Arizona and Southwest 2: 277-289. R.C. Sidle, J.E. Hook, and L.T. Kardos. 1976. Heavy metals application and plant uptake in a land disposal system for waste water. J. Environ. Qual. 5: 97-102. R.C. Sidle and W.E. Sopper. 1976. Cadmium distribution in forest ecosystems irrigated with treated municipal wastewater and sludge. J. Environ. Qual. 5: 419-422. R.C. Sidle, J.E. Hook, and L.T. Kardos. 1977. Accumulation of heavy metals in soils from extended wastewater irrigation. J. Water Poll. Control Fed. 49: 311-318. R.C. Sidle and L.T. Kardos. 1977. Adsorption of copper, zinc, and cadmium by a forest soil. J. Environ. Qual. 6: 313- 317. R.C. Sidle and L.T. Kardos. 1977. Transport of heavy metals in a sludge-treated forested area. J. Environ. Qual. 6: 431-437. R.C. Sidle, L.T. Kardos, and M.Th. van Genuchten. 1977. Heavy metals transport model in a sludge-treated soil. J. Environ. Qual. 6: 438-443. R.C. Sidle and L.T. Kardos. 1977. Aqueous release of heavy metals from two sewage sludges. Water, Air, and Soil Pollution 8: 453-459. R.C. Sidle and L.T. Kardos. 1979. Nitrate leaching in a sludge-treated forest soil. Soil Science Society of America Journal 43: 278- 282. R.C. Sidle, W.L. Stout, J.L. Hern, and O.L. Bennett. 1979. Solute movement from fluidized bed combustion waste in acid soil and mine spoil columns. J. Environ. Qual. 8: 236-241. W.L. Stout, R.C. Sidle, J.L. Hern, and O.L. Bennett. 1979. Effects of fluidized bed combustion waste on the Ca, Mg, S, and Zn levels in red clover, tall fescue, oats, and buckwheat. Agronomy J. 71: 662-665. R.C. Sidle and D.M. Drlica. 1981. Soil compaction from logging with a low-ground pressure skidder in the Oregon Coast Ranges. Soil Sci. Soc. Am. J. 45: 1219-1224. R.C. Sidle and D.N. Swanston. 1982. Analysis of a small debris slide in coastal Alaska. Can. Geotech. J. 19(2): 167-174. R.C. Sidle and C.G. Shaw III. 1983. Evaluation of planting sites common to a southeast Alaska clearcut. I. nutrient status. Can. J. For. Res. 13: 1-8. C.G. Shaw III and R.C. Sidle. 1983. Evaluation of planting sites common to a southeast Alaska clearcut. II. available inoculum of the ectomycorrhizal fungus Cenococcum geophilum. Can. J. For. Res. 13: 9-11. A.J. Campbell and R.C. Sidle. 1984. Prediction of peak flows on small watersheds in Oregon for use in culvert design. Water Resour. Bull. 20(1): 9-14. R.C. Sidle. 1984. Shallow groundwater fluctuations in unstable hillslopes of coastal Alaska. Z. für Gletscherkunde und Glazialgeologie 20(2): 79-95. H.A. Menser and R.C. Sidle. 1985. Effect of zinc levels on phosphorous and zinc content in sand-cultured soybeans. J. Plant Nutrition 8(1): 89-97. H.R. Holbo, E.L. Miller, and R.C. Sidle. 1985. Scanning recording system for multiple capacitive water-depth transducers. J. Hydrology 79: 311-318. A.J. Campbell and R.C. Sidle. 1985. Bedload transport in a pool-riffle sequence of a coastal Alaska Stream. Water Resour. Bull. 21(4): 579-590. R.C. Sidle and A.J. Campbell. 1985. Patterns of suspended sediment transport in a coastal Alaska stream. Water Resour. Bull. 21(6): 909-917. R.C. Sidle and T.H. Laurent. 1986. Site damage from mechanized thinning in southeast Alaska. Northern Journal of Applied Forestry 3(3): 94-97. P.W. Adams and R.C. Sidle. 1987. Soil conditions in three recent landslides in southeast Alaska. Forest Ecology and Management 18: 93-102. C.G. Shaw III, R.C. Sidle, and A.S. Harris. 1987. Evaluation of planting sites common to a southeast Alaska clear-cut. III. performance of ectomycorrhizal Sitka spruce seedlings three years after outplanting. Can. J. For. Res. 17: 335-339. R.C. Sidle and C.G. Shaw III. 1987. Evaluation of planting sites common to a southeast Alaska clear-cut. IV. nutrient levels in ectomycorrhizal Sitka spruce seedlings. Can. J. For. Res. 17: 340-345. J.L. Hern, H.A. Menser, R.C. Sidle, and T.E. Staley. 1988. Effect of surface-applied lime and EDTA on subsoil acidity and aluminum. Soil Science 145(1): 52-57. R.C. Sidle. 1988. Bedload transport regime of a small forest stream. Water Resour. Res. 24: 207-218. E.M. Loopstra, C.G. Shaw III, and R.C. Sidle. 1988. Ectomycorrhizal inoculation fails to improve performance of Sitka spruce seedlings outplanted on clear-cut sites in southeast Alaska. Western Journal of Applied Forestry 3: 110-112. J.R. Noel and R.C. Sidle. 1989. A program to calculate channel scour and fill. Water Resour. Bull. 25: 733-741. R.C. Sidle and A.M. Milner. 1989. Stream development in Glacier Bay National Park, Alaska, U.S.A. Arctic and Alpine Res. 21(4): 350-363. R.C. Sidle. 1976. Transport of Heavy Metals in a Sludge-Treated Forested Area. University Park, PA, The Pennsylvania State University; 135p. Dissertation. R.C. Sidle. 1980. Impacts of Forest Practices on Surface Erosion. Pacific Northwest Extension Publ. PNW-195, Oregon State Univ., Corvallis. 15 p.
R.C. Sidle. 1980. Slope Stability on Forest Land. Pac. N.W. Ext. Publ. PNW-209. 23 p.
K.R. Larson and R.C. Sidle. 1980. Erosion and Sedimentation Catalog of the Pacific Northwest. U.S. Forest Service, R-6, Publ. R6-WM-050-1981, Portland, OR. 64 p.
A.J. Campbell, R.C. Sidle, and H.A. Froehlich. 1982. Prediction of Peak Flows for Culvert Design on Small Watersheds in Oregon. Water Resour. Res. Inst.-74, Oregon State Univ., Corvallis. 96 p.
R.C. Sidle. 1983. Factors Affecting Landslides. Am. Philosophical Soc. Yearbook: 122-123. P.W. Adams, A.J. Campbell, R.C. Sidle, R.L. Beschta, and H.A. Froehlich. 1986. Estimating Streamflows on Small Forested Watersheds for Culvert and Bridge Design in Oregon. Forest Res. Lab. Res. Bull. 55, 8 p., Oregon State Univ., Corvallis. R.C. Sidle, J.W. Hornbeck, and R.R. Ziemer. 1989. Water Quality: Cumulative Effects From Forests and Rangelands, A Priority Research Program, USDA For. Serv., FER, Wash., DC. 18p. B.D. Williams, R.W. Brown, R.C. Sidle, and W.F. Mueggler. 1990. Greenhouse evaluation of reclamation treatments for perlite-pumice spoils. USDA Forest Serv. Res. Pap. INT-426, Ogden, UT, 7p. C. Knudsen, K.E. Klint, P.R. Jakobsen, K. Klitten, R. Sidle, and A. Krogsbøll. 1995. The Copenhagen Minimetro – Evaluation of Drillcore Analysis, Georadar, and Acoustic Televiewer Investigations in Boreholes and Fracture Studies in Limestone. DGU Serv. Rep.#37, Geol. Survey of Denmark, Copenhagen (confidential). V. Ernstsen, J. Jensen, S.E. Olesen, and R. Sidle. 1995. Scoping study on establishing a European Topic Centre for Soil. DGU Service Rep. No. 47, Geol. Surv. of Denmark, Copenhagen, 36p. R.C. Sidle. 2005. Options for appropriate sediment disaster mitigation strategies in Asia. In: International Symposium on Utilization of Disaster Information – Organizing and Sharing Disaster Information in Asian Countries. Japan Soc. of Erosion Control Engineering (JSECE) Publ. No. 44. pp. 51-52, JSCE, Tokyo. R.C. Sidle. 2006. Dark clouds looming over Shangri-La. Kyoto University, Institute of Sustainability Science, News Letter vol. 2, 2 p.
R.C. Sidle. 2010. Natural Disasters in Asia. Asian Geographic Magazine.